If you are looking for a classic and one-of-a-kind engagement ring that turns heads, The elegant Kate Middleton‘s engagement ring would certainly sets at the top of the most breathtaking engagement rings. In addition to sapphire depth of color, it offers a truly unique ring presence. In today’s engagement ring fashion, the combination of sapphires and diamonds are becoming an increasingly popular choice for couples that want an engagement ring that makes a bold personal statement. Here at Inter-Continental Jewelers, we want to share with you why sapphire engagement ring stands out from all rings. A sapphire is a precious and valuable blue gemstone. In addition to its charming deep blue color, sapphire is also known to come in pink, yellow, gray, black, or even colorless. Sapphires have made their place in history for being associated with royalty and romance. For centuries, royals and the wealthy have been gifting sapphires to their beloveds and handing down these precious stones as family heirlooms. Blue is an elegant color and loved for its calming hue. Sapphires are known to be linked to positive feelings, including: truth, sympathy, harmony, faithfulness, sincerity, love, friendship and loyalty. This positive symbolism is what makes sapphire engagement rings so special. Kate Middleton’s ring was once worn by Prince William’s mother, Princess Diana. She chose the ring from several shown to her in 1981 for her engagement to Prince Charles. The ring was designed by London jeweller at a cost of nearly $30,00, but today this exclusive fashion icon would be expected to retail at an estimated $320,000 due to its famous heritage. The Princess Diana and Kate Middleton engagement ring is one of the most popular ring in history.Thus, its fame grew exponentially. This famous sapphire engagement ring setting consists of a cluster of 14 solitaire diamonds surrounding a 12-carat, oval, deep blue Ceylon sapphire set in 18 carat white gold. If you prefer the classic and romantic look of Kate Middleton’s engagement ring above all others. Inter-Continental Jewelers-Houston can give you the royalty experience in the ring you crave. 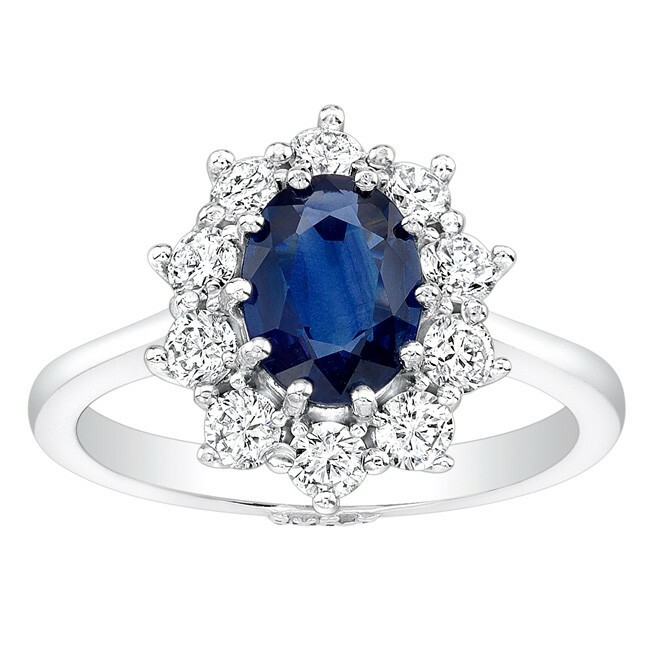 We’ve crafted sapphire engagement rings similar to Kate Middleton ring in14k white gold. The sapphire engagement ring, with a halo consists of sparkling diamonds, perfectly reflects the definitive beauty and classic tailored looks of Kate Middleton. Engagement rings designed to fit a princess at affordable prices. Get your Kate Middleton ring Now! Sapphire Engagement Ring in 14k White Gold; 2.20 Carat Total Weight and Royal Wales Diamond Sapphire Engagement Ring in 14k White Gold; 1.65 Carat Total Weight. Also, Check out more of our gorgeous collection of rich blue sapphire rings. At Inter-Continental Jewelers Houston, We make sure to design and carry the best quality and top of line diamond jewelry and diamond engagement rings. We’ve designed a marvelous collection of diamond and gemstones engagement rings in unique and up to date styles, which you can view on our diamond engagement rings and halo engagement rings gallery.